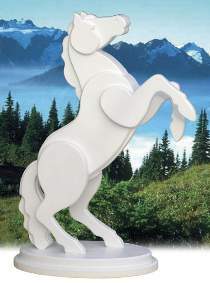 This striking stallion will look spectacular at the entrance to your garden, or make one for each side of your porch, entryway or driveway. Made from layers of "1x12" and "2x12" stock. Measures 41"H. All patterns are drawn FULL SIZE.